This crochet four leaf clover is a quick project that works up in no time. Make one for all the lucky little leprechauns you know! For this pattern you can use any yarn of your choice and the hook size recommended for that yarn. Crochet Four Leaf Clover Pattern Notes..
Hook: I used a US I9/5.50mm but you can use the recommended hook size for the type of yarn you selected. 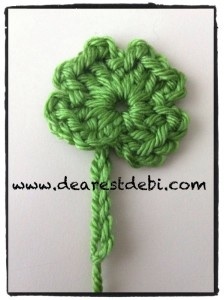 Crochet Four Leaf Clover Pattern.. Please share your Crochet Four Leaf Clover pictures on my Facebook WALL or hook up your project on Ravelry.